On May 6, 1757 King Frederick II of Prussia sent 65,000 men on a maneuver to turn the right flank of 62,000 Austrians strongly deployed along a ridge east of the city Prague under the command of Prince Charles of Lorraine. Both sides were poised for for a battle which would be the largest of the war. 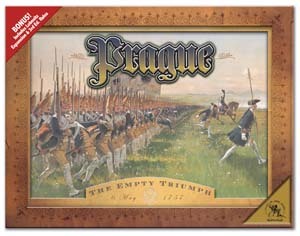 PRAGUE allows players to explore all aspects of the batlle with multiple scenarios.